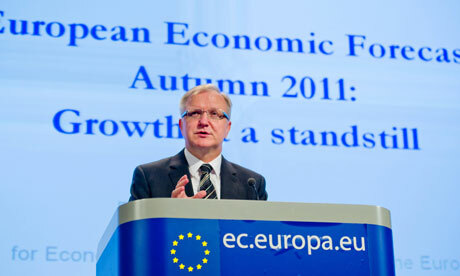 9.18am: Just in case anyone was in doubt about the situation today, EU monetary effairs commissioner Olli Rehn has warned that Europe has just 10 days to “complete and conclude” its crisis response. The markets for the last six months (and longer) have been crying out for the ECB to go postal, print a tsunami of new paper, buy every troubled asset going, and (ahem) “save the world”. Stern teutonic monetarism has won the day. Don’t these people understand that such measures always come with massive unforeseen consequences? Here’s a rule of thumb any idiot can use: more centralisation means more systemic fragility. Proponents of any such centralisation have to weigh the benefits against the fragility, because when the black swans begin to flock excessive fragility tends to mean collapse. This entry was posted in Current Affairs, International Relations and tagged angela merkel, euro fail, eurobongs, herman van rumpuy, mario monti, new world order, nicholas sarkozy, olli rehn. Bookmark the permalink. Aren’t the Greeks just making a Drachma out of a crisis? I’m Polish and while we’re not in eurozone, we’re in EU and still technically aspiring to joining monetary union. Poland was consistently favoring preserving national sovereignty versus federalization from the time of accession. Yesterday our minister of Foreign Affairs went to Berlin and made a speech pretty much giving strong support to German plans. He said that it’s new phenomenon in our history to be more afraid of German inaction, than their action. There was some obvious domestic drama, with fringe voices to put the man to the trial by the Tribunal of the State 😉 . Regardless, it does highlight one factor that goes in favor of herding cats and actually pulling full (or at least functional) monetary union for Euro. It’s fear. Poland doesn’t have 90+% debt and isn’t even in the eurozone, yet it’s already scared. For some time problem will only get worse, so the fear will have more and more to say and just might overrun nationalisms of member states. I’d say it’s quite possible to get total collapse of Euro, but it may pull through to a tougher monetary union (possible with Greece kicked out of it). Another event to propel us in that direction might be failure of Hungary. If it goes down hard it will be severe blow to nationalism. Whenever it is mostly due to bad specific policy by Victor Orban, or his general idea of pulling trough relying only on state’s own power. While the problems here are overwhelmingly political, the danger is financial: it’s a default leading to more defaults, a credit contraction, stock market crashes, and a deeper global depression. The contradiction is that Germany either has to spend a huge chunk of its GDP bailing out bad mediterranean debt to sustain the Euro (or federalise) or it has to accept the end of the Euro and see the DM strengthen. As much as Merkel fudges she can never justify sacrificing that much. The German people just won’t accept it. As for Poland, I am not an expert, but my impression is that you will come out of this very well — very hard working population, young, lower debt than most of the Eurozone. When I lived in London I encountered many Poles and i was always amazed by Polish work ethic. I think the best thing for Poland is that we’re not in the game of free lunch for very long. From 1989 there just wasn’t enough time to get this much corrupted, or maybe something was done less wrong in financial system. As for Germany IMO fall od Euro is quite likely. But it’s not yet the only option. Germans still make declarations that they might do it… if their postulates of more centralization (or federalization) for EU are heard. It is still a choice of two evils for them. They are profiting from EU and monetary union. Why would they spend billions for subsidies of French farmers if they didn’t get anything in return? If they could get the union to survive, while not paying down debts of it’s weakest nations for who knows how long, they’d prefer it. Now they know very well that empty promises and thresholds backed by nothing (like max 60% debt for eurozone countries) are worthless and would only be convinced by real concession of economic power. My point is that, there’s still a chance that these concessions will be made – in face of rising fear. Both Greece and Italy had their prime ministers step down on the whim of EU bureaucrats, when crisis intensifies they might just give up some of their sovereignty. I’d say it’s less likely than meltdown, but still valid possibility. This is why I pulled all my money out of the market. Technical and fundamentals mean nothing. Im not interested in sitting around guessing when the next liquidity injection is going to come from a central banker. Was there ever any doubt? The central banks will print and print, until, like every other money printing episode in the history of man we get hyperinflation. Since I live in California, I’m already getting ready to sell trinkets to hords of Asians that will come here and buy up anything not nailed down with their now strong currencies.